Top quality, with sweet, crunchy pods that remain totally stringless. High yielding plants show excellent tolerance to powdery mildew. Good source of vitamin C, vitamin K and vitamin A. Sow outdoors where they are to crop, in flat drills 15cm (6in) wide and 5cm (2in) deep. Sow in a zig-zag fashion along the drill, allowing 5cm (2in) between seeds. Fill the drill with fine soil and firm down gently. Allow 60cm (2ft) between rows. Keep moist. Seedlings usually appear in 10-18 days. Early sowings benefit from frost protection. Provide canes for support, plants can be self-supporting if grown in a block. Water well until plants are established. Successional sowings will ensure a continuous supply and long harvest. Pick regularly for the best yields. Protect seedlings from birds with twigs or bird scarers. Water well during dry spells. 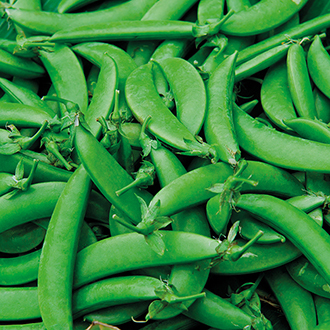 Mature pods can also be shelled for peas.